In 1872, three years after a civil war had brought about the Meiji Restoration, Japan was rapidly evolving from a feudal society into a quasi-democracy. The country was looking to the West for rapid acquisition of all the technologies of a modern society and in addition to the obligatory ships and armaments it was also eager to adopt steam powered transport. Trains were the future. Test runs having been satisfactorily completed between Shinagawa and Yokohama, on 14 October of that year, the first commercial railwayline was inaugurated and, as the train pulled out of the old Shimbashi station at Shiodome, the crowds cheered and the passengers enjoyed a journey of a little under an hour to Sakuragicho in Yokohama, not that dissimilar from today. But train systems were prohibitively expensive to develop and a cheaper solution for mass transport inside the capital was required. And so, after many years of debate, the government turned to the electric tramline, something to be first successfully demonstrated in Kyoto in 1895. Opening in 1903, the tram system grew to over forty separate lines with the peak utilisation actually in the early 1960's. But by then the more efficient busses as well as the motorcar and the rapidly growing subway system were eating into the networks reason to be and by the 1970's the trams were all but consigned to history. Today the trams do still exist in Tokyo but are a ghost of their former selves. Threatened with closure in the 1960's, an urban uprising eventually secured the life of the Toden-Arakawa line in northern Tokyo. Running from Minowabashi, near Asakusa, to Weseda, home of the university, the line remains a public service and popular tourist sight to this day. The only other tramway to still operate in Tokyo is the Tokyu-Setagaya line from Sangenjaya, the branch-line being the remnants of the once major Tamagawa line from Shibuya. With the little bell that warns of its approach, the trams are affectionally referred to as "ding ding trains" or "chin chin densha" in Japanese. And that has an entirely different meaning to a thirteen year old school boy in Japan. 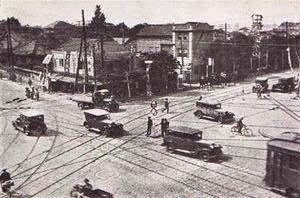 Roppongi Crossing c1930. Trams and cars compete for the future. My thanks to Timo Budow for tracking this picture down.